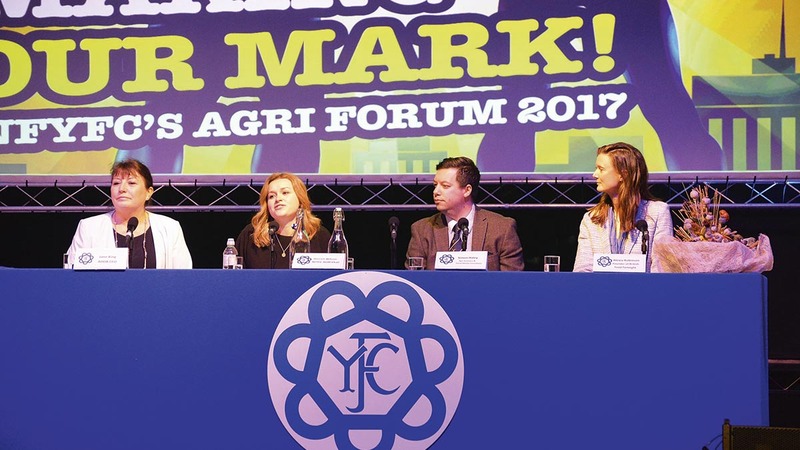 Young farmers have been urged to ‘make your mark’ when promoting the industry online. Jane King, Harriet Wilson, Simon Haley and Alexia Robinson at the AGM17 agri-forum. Young farmers grilled the Agri-forum panellists on how to avoid ‘preaching to the choir’ and spoke of a battle with what they called the farming bubble. Co-founder of @AgrichatUK and social media guru Simon Haley said within the analytics features in all social media platforms users can pinpoint its location and schedule a tweet to go out to people within a specific radius of where they are. “If we know what hashtags they are talking about, we can get a message direct to those people. They do not know we are targeting them it just appears on their feed,” he said. Alexia Smith, founder of British Food Fortnight echoed the claims and said the bubble was ‘one of the real traps’ of social media. She said: “I am singing hallelujah when I hear what you are saying. The importance of engaging with an online personality and promoting a brand online was also high on the agenda in the agri-forum but Mr Haley said users must always have a strategy. He said social media was ‘not a fad anymore’. “If your audience is on snapchat and Instagram, why wouldn’t you be on there?”, he added. AHDB chief executive Jane King agreed, pushing Brexit as an opportunity to push the British brand.